There was a time when if you lost a tooth, or teeth due to decay, gum disease or trauma to the mouth, you didn’t have many options. 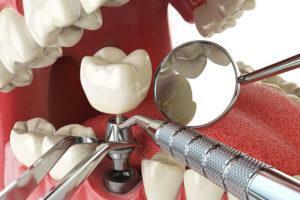 Dentures and bridges (synthetic teeth joined together by metal) were the patient’s only choice for many years. These brought their own problems-slipping dentures; uncomfortable bridges; ill-fitting and prone to shifting around. These days, massive improvements in dental technology mean we have an alternative solution to missing teeth-the Dental Implant. 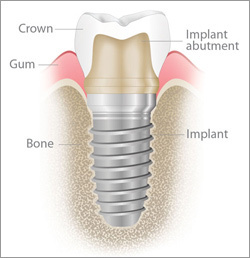 A Dental Implant is essentially a replacement tooth root. It’s a titanium post that is screwed firmly into the gum, providing a strong foundation for fixed teeth that are custom -made to replace your own missing natural ones. 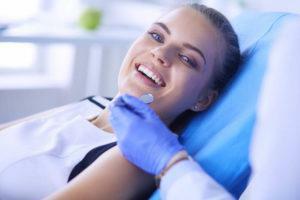 You need to have a consultation with the dental surgeon to make sure you’re a good candidate for an implant, as healthy bones and gums are important in order to hold the implant properly. People who have very low or very thin bone mass in their jaw (often due to aging), or some who suffer from uncontrolled chronic disorders like diabetes or heart disease, may not be candidates. 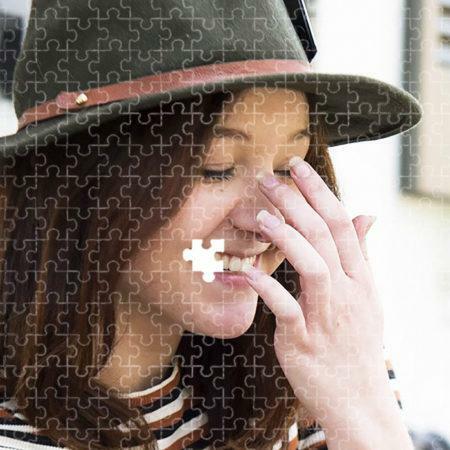 There are the obvious cosmetic reasons, if the gap in your smile bothers you-but more importantly the teeth of a human being need to come together properly to eat and chew food. The teeth grow in specific shapes and locations to bite, incise, rip and chew; and the jaws come together nicely without any pressure damage. When you’re missing teeth, it impacts not only your smile, but your jaw comfort, eating ability, and sometimes even your speech. So I’ll get a New Tooth Overnight? No. 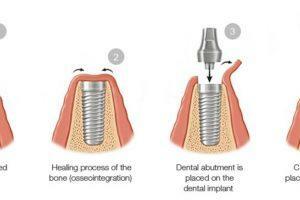 The titanium implant post is inserted in a precise procedure, into the bone socket of your missing tooth. After that you need to wait a few months- anything from 3-6 months depending on the patient-for the implant to integrate into the bone of the jaw-the bone actually grows around the implant- to make a secure, stable foundation for your new tooth or teeth. The dentist takes an impression of your teeth to make up a model of your ‘bite’, which shows all the types of teeth and the arrangement in your mouth, and the new replacement tooth-the ‘crown’-is made based on this model to match the size, colour and shape of your natural teeth. They look perfect; identical to your own. If you’re missing several teeth next to each other, you can get individual implants for each one, or if you’re missing 3 teeth in a row the dental surgeon can give you two implants and adhere the middle tooth to the ones on either side, so you get two implants; but three teeth. Like clever Lego. Once the implant has bonded to the jawbone, a small connector post — called an abutment — is attached to the post to securely hold the new tooth in place. Barring unusual circumstances, they should last a lifetime-SmileStore-the Dental Specialists offer a lifetime guarantee on all of their implants. You need to commit to a routine of good dental hygiene afterwards-there’s no point in going to all the trouble of getting yourself dental implants unless you take care of them! Brush, floss and get regular cleaning and check-ups, and your teeth will serve you well for many years to come.